Heatherwick Studio converts an old paper mill into a beautiful, botanical distillery. The new glasshouses are used to grow the botanicals for Bombay Sapphire’s gin. 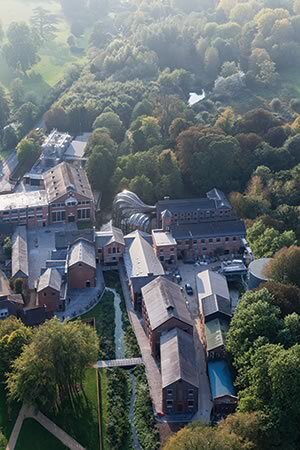 Pictured here is the new Bombay Sapphire Distillery in Laverstoke, Hampshire, UK. Heatherwick Studio retrofitted an old paper mill into gin-maker Bombay Sapphire’s first in-house production facility. Completed in September of this year, this new botanical distillery – which features two glasshouses to grow specimens of the 10 exotic plant species used in the Bombay Sapphire distillation process – has achieved a BREEAM ‘outstanding’ rating for sustainability; the first facility in the drinks manufacturing industry to be awarded this rating. Since the 5-acre site is located within a designated conservation area, Bombay Sapphire and the design team required a green strategy to put Laverstoke facility back to good use. The Test River, which flows through the property, plays a crucial role in the design and function of the distillery. 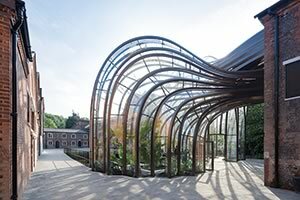 Bombay Sapphire commissioned the project in 2010, and hired a team led by Heatherwick Studio to reimagine a derelict, water-powered paper mill as a world-class distillery that also would be open for members of the public to visit. The site contains more than 40 old buildings, many of historical significance and showcasing fine examples of Victorian and Edwardian architectural styles, which have been renovated and restored. 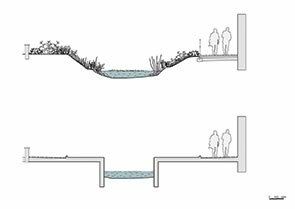 Central to the development of Heatherwick’s master plan is the Test River, which was previously contained within a narrow, high-sided concrete channel and largely covered over as the site was developed over many years. 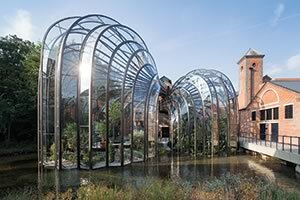 According to the BRE Trust, the largest UK charity dedicated specifically to research and education in the built environment and a key organization in developing BREEAM, sustainability was vitally important to Bombay Sapphire at Laverstoke Mill. The design of a low-carbon, BREEAM assessed, flagship distillery underpinned the design, which was supported by the client and design team from the outset. “There was a strong desire to reduce any impact on the existing environment, and ‘cradle to grave’ considerations formed a major part of the design philosophy,” the Trust says on its BREEAM website. 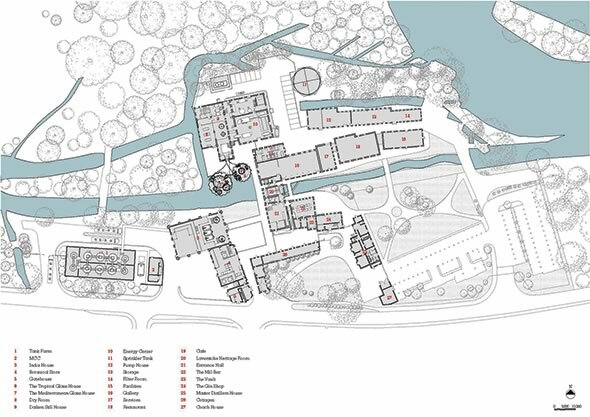 “This included the recycling and reuse of existing building materials from demolished buildings across the site, and an ingenious idea to reuse spent botanicals from the distillation process as fuel for the biomass boiler – supplying heat and hot water to the whole site. The project scored 100 percent of available credits in the Energy and Management categories and more than 90 percent of credits in the Water, Materials and Waste categories. There was an additional 5 percent worth of innovation credits scored for exemplar performance levels achieved. BREEAM Assessor – GWP Project Services Ltd.
to maintain the warm climates for the plant species to flourish. 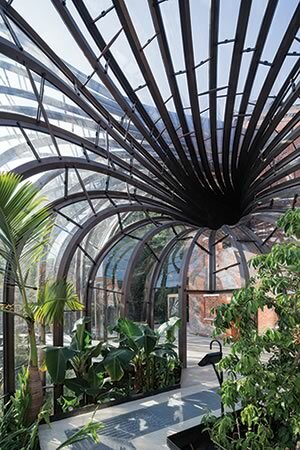 According to Heatherwick, the fluid geometry of these new glass buildings was influenced by recent advances in glass technology and by Britain’s rich heritage of botanical glasshouse structures. 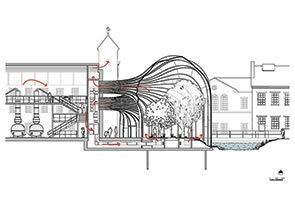 Thomas is an Honorary Fellow of the Royal Institute of British Architects; a Senior Research Fellow at the Victoria & Albert Museum; and has been awarded Honorary Doctorates from the Royal College of Art, University of Dundee, University of Brighton, Sheffield Hallam University and University of Manchester. In 2013, he was elected a Royal Academician by the Royal Academy of Arts, London. In 2004, Thomas was the youngest practitioner to be appointed a Royal Designer for Industry. He was awarded the Prince Philip Designers Prize in 2006 and the London Design Medal in recognition of his outstanding contribution to design in 2010. In 2013, he was awarded the Critics’ Circle Visual Arts and Architecture Award, and he was appointed Commander of the Order of the British Empire (CBE) for services to the design industry. 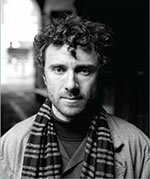 Heatherwick Studio was formed in 1994. Today, a team of more than 140 architects, designers and makers work from a combined studio and workshop in Kings Cross, London, UK. Notable projects include the Olympic Cauldron for the 2012 Olympic Games, the New Bus for London, and the award-winning UK Pavilion for the Shanghai World Expo 2010. For over 40 years, the Masonry Advisory Council has hosted the Excellence in Masonry Awards, recognizing architectural design excellence and the talent behind making those design concepts a reality. Some of the greatest architects in Chicago, from both large and small firms, have competed for and have been honored with these awards. After a hiatus, the event is being reinstated to recognize and celebrate today’s modern designers. Laticrete, a manufacturer of construction solutions for the building industry, says its Masonry Veneer Installation System (MVIS) was honored with a gold medal in Home Builder Executive’s Innovation Awards issue.